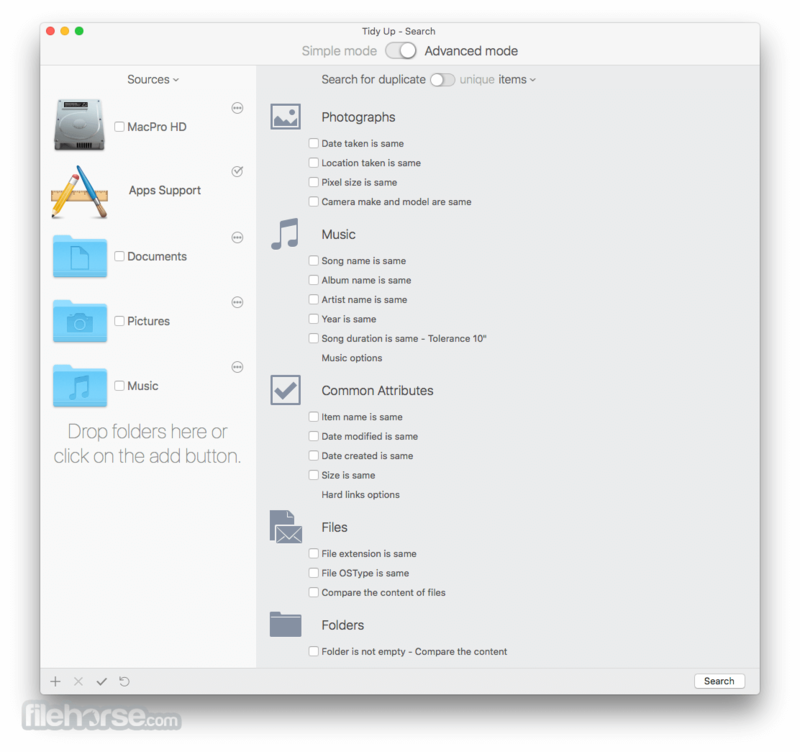 Tidy Up for Mac is the duplicate finder and disk tidiness utility for expert users. It's the only fully-featured duplicate remover available on the market, and allows you to efficiently clean your computer from the junk it built-up. Tidy Up comes with a search mode called Simple Mode, which includes more than 100 pre-defined smart searches. For a customized strategy you can opt for Strategy Wizard, which, based on your answers, chooses the appropriate criteria to find duplicates and creates a "Smart Box" that will contain the items to be removed. For a further tuning of the search criteria you can opt for the Advanced Mode. The advanced method is the most customized method offered on the market. It allows you to find duplicate files and packages by the owner application, content, type, creator, extension, time modified, time created, name, label, visibility and date/age. 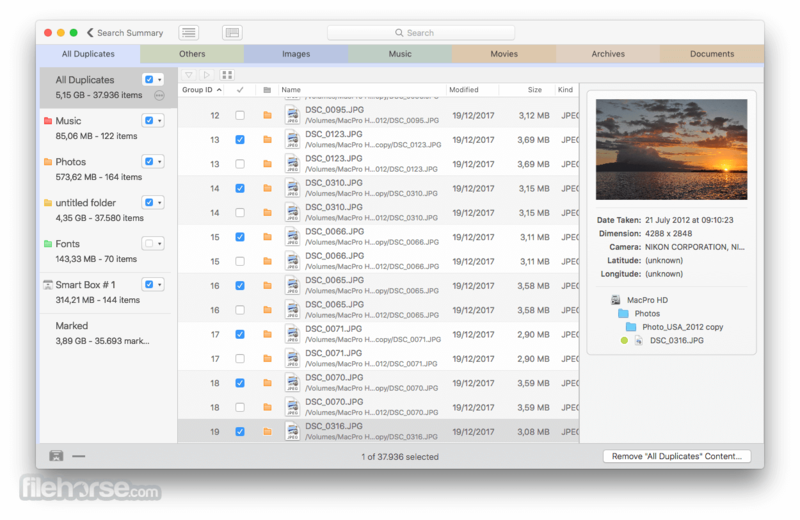 You can also search by the tags, duration and bit installments of MP3 and AAC sound files and EXIF metadata; find the duplicate e-mail messages; search the contents of the Photos, iPhoto, Aperture, iTunes, databases and Mail mailboxes; synchronize deletions with iPhoto, Mail and iTunes. Tidy Up allows you to find duplicate folders by name, date modified, date created, label, visibility, empty folders, their content and more. Tidy Up is fast; it doesn't index the scanned volumes, so you don't waste additional precious space. With its multitasking capability, you can do more searches at the same time and take advantage of the latest Mac computers and operating systems. 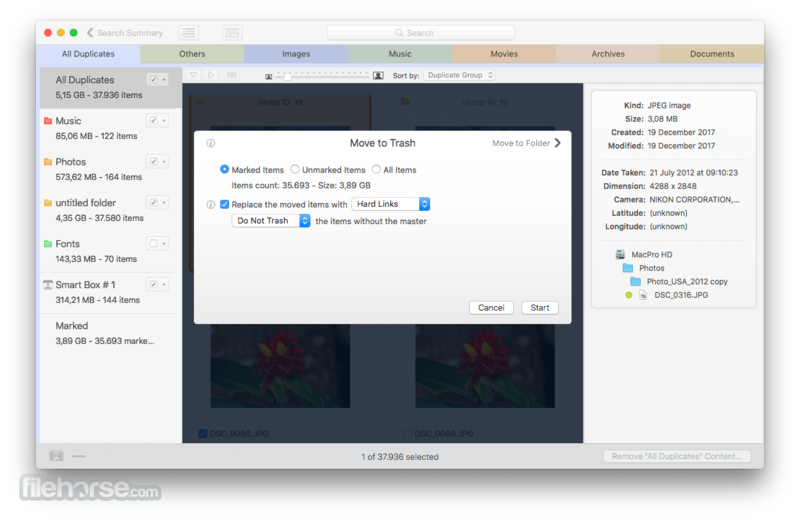 One of the most interesting features of Tidy Up for Mac is the capability to separate the found items for a quick and easy organization, through the use of "Smart Boxes". For example, smart boxes can be used to separate the items belonging to a specific album, playlist or mailbox of the supported applications. Tidy Up offers a full-size preview of the most commonly used files such as audio, media, text, pdf, graphics, fonts and more... Quick Look is available too. 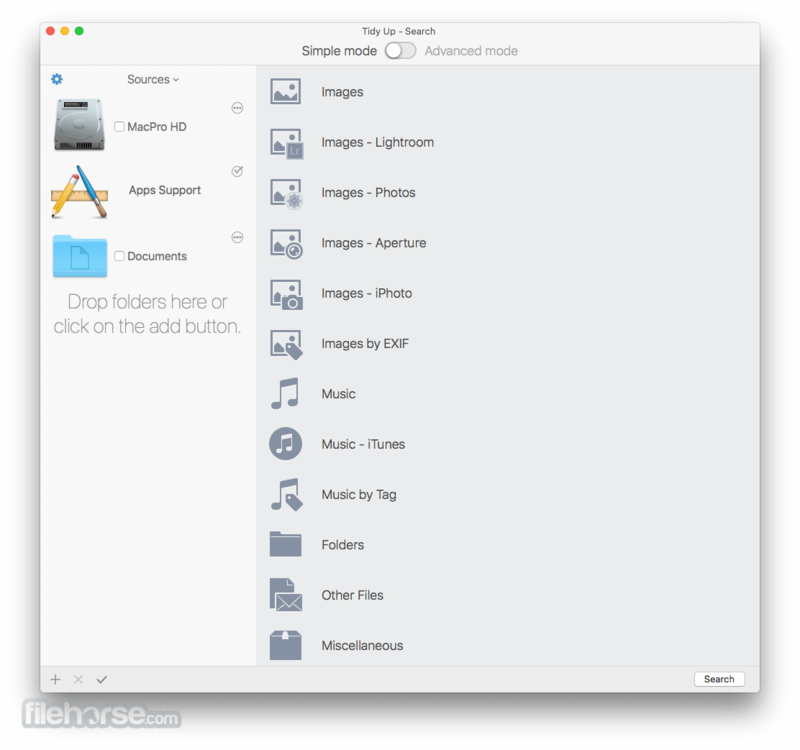 Tidy Up for Mac allows you to trash and move items, replace the moved and trashed items with aliases or symbolic links, burn, assign colored Finder tags and export the list of found items into html and text files. A snapshot of the result can be saved and later managed. Tidy Up has a security system that assures you will keep at least one file of the duplicate group on your disk; it offers the possibility via menu items to undo copied and moved items and to restore trashed items as long as the trash is not emptied, even after a restart of the computer. Note: Only 10 found items can be managed. Requires 64-bit processor.